Kim van Kets was born and raised in the rural areas of the Eastern Cape, studied law at Stellenbosch University, was admitted as an attorney by the High Court and spent many years in legal practice and the corporate world, most recently working as the legal and compliance manager of the Mercedes-Benz manufacturing plant in East London. Kim van Kets is currently self-employed as a legal consultant/ corporate trainer, freelance writer, author and motivational speaker. 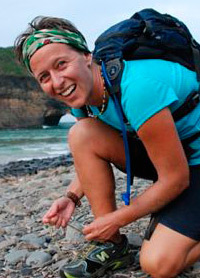 Kim van Kets have taken part in numerous multi day and self supported races, Kim van Kets is an endurance athlete and adventurer best known for my “Tri the Beloved Country” Expedition which involved a self powered 6 772 km circumnavigation of South Africa on foot, bike and kayak in 148 days. Despite opportunities to have married someone sensible Kim married Adventurer, Peter van Kets (2x Atlantic Rower and only African to have rowed solo across any ocean and one of the few South Africans to have trekked to the South Pole) and is a mother to 9 year old Hannah. Are you wanting to book more Corporate Entertainment we have South Africa`s finest Artists. Hire a Comedian, master of ceremonies, Live Bands, Dance Acts, Hire a Magician We have the very BEST in Live Entertainment for your function or event.